A number of DUP councillors across Northern Ireland have declined to comment on how the party’s grass roots would respond to an Irish language act. 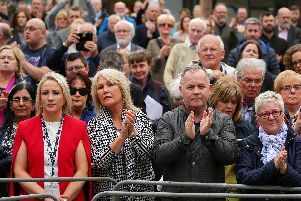 The News Letter rang a sample of 20 local representatives on Tuesday and not one of the 10 who answered their phones was prepared to discuss their views on the prospect of new legislation. Statutory protection for Irish language has been one of Sinn Fein’s main demands prior to re-establishing the Northern Ireland Executive. In a Facebook message yesterday, former DUP leader Peter Robinson said it was “entirely legitimate” for Sinn Fein to press for the implementation of an act – but said statutory protection for Ulster Scots should also be included. However, the elected representatives were referring all questions to the party press office. In Tuesday’s News Letter, TUV leader Jim Allister said an Irish language act enshrined in law would be a “vehicle to hollow out our Britishness,” and called on DUP members to “take a stand on this pivotal issue”. Other DUP councillors not wishing to comment were West Tyrone councillor Mark Buchanan, Castlereagh representative Sharon Skillen, Cllr Mark Baxter from Craigavon and Enniskillen councillor Keith Elliott. Cllr Scott Carson from Lisburn said “you would need to go through the party’s press office”.